STI Evolution Foam™ – The innovatively crafted STI Evolution Foam™ molded midsoles in the Marana replaces your typical EVA, PU and heavy rubber with a durable, abrasion-resistant, ultra-lightweight and high-impact rebound cushioning foam. Its molecular build is resistant to abrasion and has a high-impact rebound quality so it won’t pack out when landing hard. Plus, STI Evolution Foam™ enhances the cushioning and comfort of the footbed and noticeably decreases the weight of the shoe. Non-Slip Grip Outsole – Created with a thick herringbone tread with deep grooves, the Marana outsole has an insane grip and just doesn’t wear down with all the abuse skateboarding puts it through. Injected Rubber Toe Cap – The Marana toe cap is fused-on with injected rubber and has no stitching making it super hard to wear through, no matter what your skate style is. For more details and dissected photography on the Marana design, visit the new Marana product page on etnies.com. Available now for US$75 (€80 / £60), the Marana comes in the red/white Ryan has been seen wearing this year as well as an all-black color. The new performance shoe can be found at etnies.com and etnies retailers around the globe. Get caught up with Ryan in this full written interview, complete with a photo spread and Under Our Feet Tour: Europe video, posted on etni.es/marana--sheckler. 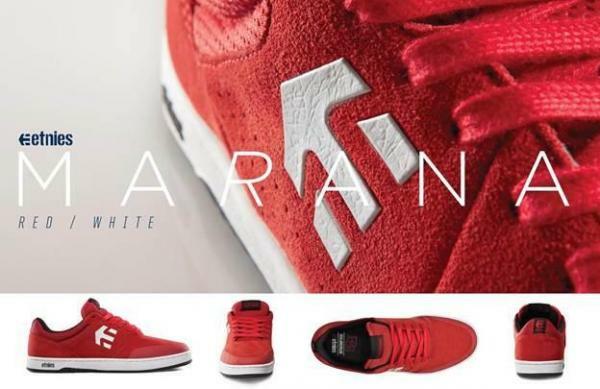 For more information on the etnies Marana, visit etnies.com or keep up with the brand on facebook.com/etnies.